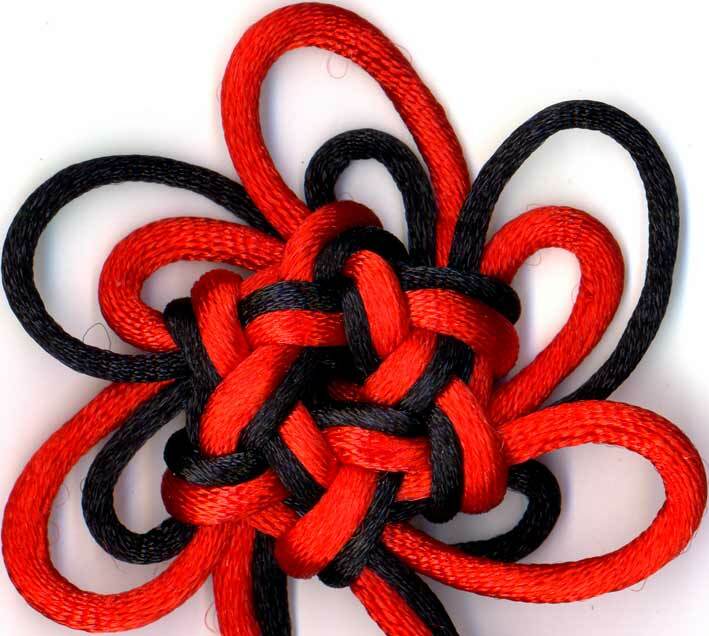 In order to more thoroughly understand the structure of the knot, I tied it in a high contrast colour (unlike the final colour which will be either grey or black) and sidelined it for extreme emphasis. This activity highlights a feature of sidelining a polygonal knot: an absolutely parallel sideline cord will have ears that alternate inside and outside the main cord. Outlining in the same colour hides the phenomenon, but if you wanted to sideline your knot and have the sideline ears stay either inside or outside of your main cord then you will need to hide a cross-over somewhere... or feature the cross-over. I once experimented with this idea by coiling the sideline cord over the main cord ears, but unless you're going for complete coverage it didn't look very good to my critical eye.